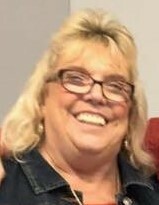 Connie J. Knapp, 59, of Logansport, passed away on December 1, 2018 in her residence. Born on May 5, 1959 in Monticello, IN she was the daughter to the late James Robert and Donna (Landis) Logan. On August 11, 1990 in Logansport she married Gary Knapp who survives. Connie was a homemaker and formerly worked at Wilson Foods. She enjoyed canoeing, the outdoors and spending time with her family. Surviving along with her husband are three sons, Shannon (Andrea) McIntire, Frankfort, IN; Eric (Rebecca) McIntire, Rochester, IN; Brandon (April) McIntire, Fort Wayne, IN; step daughter, Emma L. (Matthew) Jones, Logansport; step son, Alexander Knapp, Rossville, IN; five sisters, Dixie Becker, Logansport; Nita (Brad) Pool, Monticello, IN; Cindy (Rex) Whitmore, Monticello, IN; Rhonda (Al) Dye, Monticello, IN; Sandra (Don) Weida, Monticello, IN; and brother, Dale Logan, Lake Cicott, IN; fourteen grandchildren, several nieces and nephews. One sister, Deb Risk, preceded in death. A Celebration of Life gathering will be held from 4:00pm until 7:00pm on Wednesday December 5, 2018 in Gundrum Funeral Home. In lieu of flowers memorial donations may be made to the family to help with expenses.